Kitsap County. (November 9nd, 2011) Kitsap Pumas are pleased to announce that Admiral, the Original British Football brand to American and England’s top teams, Admiral, will be official supplier to Kitsap Pumas from the start of the 2012 Season. Kitsap are 2011 USL Professional Development League Champions. Admiral is the same brand that provided team wear in the 1970’s and 1980’s for the England football teams, Manchester United, Tottenham Hotspur, West Ham, Southampton and Leeds in the English Premier League. Admiral was also the market leader in the United States on the shirts of the Los Angeles Aztecs, Tampa Bay Rowdies and Vancouver Whitecaps. Players who have worn Admiral include soccer legends Pele, Beckenbauer and Cruyff while they played for the New York Cosmos. Today the brand is also worn by the 2011 NASL Champions Minnesota Stars. With Charlotte Eagles in the USL Pro league, Virginia Beach Piranhas in the USL PDL and Norfolk Sharx in the MISL recently announcing that they will also wear Admiral from 2012. 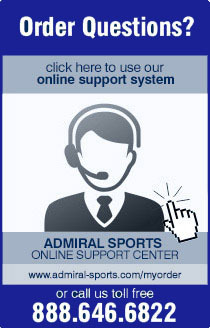 More clubs will announce that they are partnering with Admiral for next season in the next few weeks. From 64 teams Kitsap won the PDL title in only their third year in the league. Dominant from the start of the 2011 season, Kitsap had 12 wins, 1 loss 3 ties. They beat previous champions Laredo Heat to the title 1-0. The game will be remembered for Robby Christner’s only goal and a rocket shot by Laredo's Greg Mulamba that thundered off the post and back into the field of play in the closing seconds of injury time. Kitsap have two division titles, two quarterfinal appearances, three U.S. Open Cup appearances and now a PDL championship. “We were so impressed with what other clubs had said about Admiral – particularly that the quality of their product and service is outstanding. It’s their approach that’s different, they’re totally focused on community soccer and they go the extra mile to deliver what others won’t. When we launch the custom designed kit we have for next season I’m sure the players and fans will love it!” Said Robin Waite, CEO of Kitsap Pumas.